Geraldine Brooks is the author of four novels, the Pulitzer Prize-winning March and the international bestsellers Caleb's Crossing, People of the Book, and Year of Wonders. She has also written the acclaimed nonfiction works Nine Parts of Desire and Foreign Correspondence. Her most recent novel, Caleb's Crossing, was the winner of the New England Book Award for Fiction and the Christianity Today Book Award, and was a finalist for the Langum Prize in American Historical Fiction. Born and raised in Australia, she lives on Martha's Vineyard with her husband, the author Tony Horwitz. "There's romance between Brooks and the world, and her writing is as full of heart and curiosity as it is intelligence and judgement." "Intelligent, thoughtful, gracefully written and orginal. . .Brooks tells a believable and engaging story." "Intense, gripping. 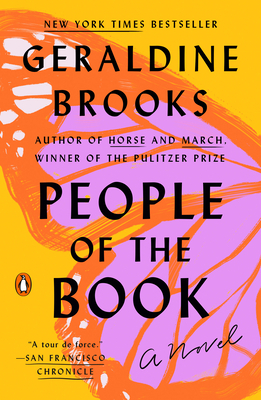 . . People of the Book, like her Pulitzer Prize-winning previous novel March, is a tour de force that delivers a reverberating lesson gleaned from history. . . . It's a brilliant, innately suspenseful structure, and one that allows Brooks to show off her remarkable aptitude for assimilating research and conveying a wide range of settings. Also on full display is her keen sense of dramatic pacing." "[A] marvelously intertwined narrative, with one strand tied to the contemporary world and the other leading us back into European history, into wars and inquisitions and family tragedies, all of this making up avidly narrated, powerfully emotional quest." "Richly imagined and at times almost unbearably exciting. . . . An ambitious book, a pleasure to read, and wholly successful in its attempt to give a sense of how miraculous, unlikely and ultimately binding the history of objects can be."